356C/Early 901 calipers have not been available for many years. Of couse this is not really surprising considering they only made the 356C for two years (almost fifty years ago) and these brake calipers only appeared through 1968. Couple this little nugget of information with the ever present enemies of rust, corrosion, time and all the drum brake guys who want to convert to disc brakes, and you can see why the availablility of rebuildable cores is quickly dwindling. However, all is not lost! 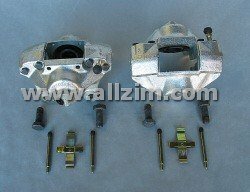 Zims Autotechnik has found a brand new brake caliper that will literally bolt straight up and work on your 356C/Early 901. BUT, here's the catch...you have to replace them in pairs. Now, you might be saying "Hey, I only need one" and you might be right. HOWEVER, for safety and performance reasons, these must be replaced in pairs. With this in mind, we have priced them very affordably so that a pair of brake calipers won't bust your restoration budget. You need to order ONE (1) of these for one car. That gets you a pair. Calipers are shipped without brake pads. 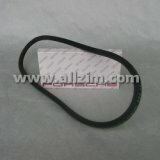 Uses standard 356C356C/Early 901 brake pads.